VNOG Blog: A letter from John K.
Well, see, now you have to blog about your racy paintings in France. 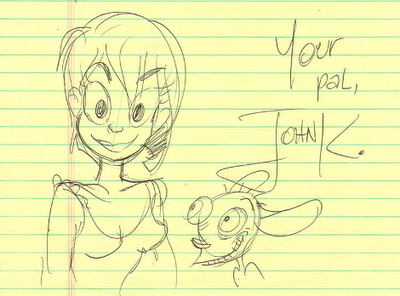 John K. Rocks!!! his views and theories are gold. He just gives and gives at his blog as well, so generous. Bless the man..
Wow that's awesome! That's one of the reasons why I love this business I'm in. Generally people I've come across who have something to share, actually shares it! The ones you want to learn from only got as good as they are, because they care about art passionately, everything else comes second. That's very unique, in the status minded world we live in. I had the pleasure of meeting Jim Smith a few months back at a gallery I was showing at, and he was to put it mildly, very down to earth. Learn and pass it on seems to be the code in our community and I love that. I loved reading this and think it's awesome that Jk would take the time out to share some of his thoughts and even a Preston Blair book with an aspiring artist he didn't even know. One heck of a guy! Thanks for posting it Victor! Query-what's up with the racy french paintings? Might be a nice addition to the Blog??? I'm surprised you even have time to update your blog with what I've heard about the crunch time over there. Amazingly enough, one of your co-workers, who will remain unnamed, has been overwhelmingly generous with his time to me very similarly to what John K did for that kid. The advice that he has given me has been absolutely priceless. Mike Barnett - Now you've got me curious about who he/she is. Someone is ruining the curve for the rest of us! I'm not the first person to receive a little friendly advice; Brad Bird had Ollie Johnston and Frank Thomas to give him feedback early on. I spoke to Andreas Deja several months ago and he told me he had received some good advice from Eric Larrson before he got into the business. Even that kid got a break with John K. I hope it's not looked at as a bad thing. Even this blog you keep is a great resource for us up-and-comers. they give all the advice in the world! utterly awsome, I'm going to try and draw better.